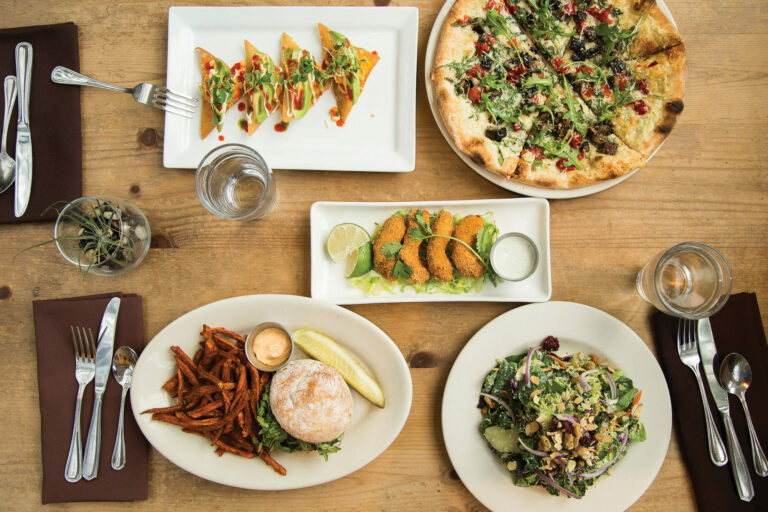 Start with vegetarian mainstay Cafe Flora (2901 E Madison St; cafeflora.com) in Madison Valley—the plant-filled spot serves inventive seasonal plates (melon shiso or apple farro salad, anyone? ), but favorites like the hearty portobello Wellington are year-round staples. Snag a seat in tiny Anar (2040 Sixth Ave; anar.life) in South Lake Union for a bowl of mujadara (lentils plus Seattle-based Ellenos yogurt) paired with apricot orange blossom “mystic” kombucha. Despite its name, Georgetown Liquor Company (5501B Airport Way S; georgetownliquorco.com) serves up delicious fare aimed toward herbivores. Vegetarian and vegan options range from root vegetables slathered with gooey goat cheese to vegan Carolina barbecue ham sliders. For a multicourse meal reverential of all things vegan (signaled by the gong before dinner), try Harvest Beat (1711 N 45th St; harvestbeat.com) in Wallingford. Its delightful plates highlight local produce and wine from Walla Walla to the Columbia Valley.